OFF with their heads! Their blood-sucking heads! Hey guys! I just got back from a surprisingly fun trip to Manitoba... Winnipeg is a actually a cool city, who knew?! Last time I spent a few days in Winnipeg was when I was a wee tween, camping with my family. The most memorable thing about that trip (other than the sight of my parents actually pitching tents and sleeping on the ground) was the size of the mosquitos in the place. Massive! They could give horseflies a run for their money. Knowing that my bare arms and legs would constitute a tasty feast for those blood suckers, I thoughtfully brought along a trusty can of OFF! Smooth & Dry insect repllent. I first used this stuff last summer, on a kayaking trip. (Which was ludicrous, by the way. Go ahead and try imagining me on a kayak. Hilarious, right?) Not only did Smooth & Dry keep the bugs off, it lived up to its name. No weird sticky-feeling film here... the aerosol spray deposited the repellent evenly, and then I pretty much forgot about it. There's a fruity scent to the spray, which, although it does smell a bit fake, is leaps and bounds better than the DEET stank. As time went on, the fruit smell faded a bit, and you could detect the typical bug-spray smell, but overall, using Soft & Dry was a much nicer experience than I've come to expect from bug sprays. So did I avoid being mosquito food during my Winnipeg trip? Well, for some reason, the spray part of the can got all effed up. It slowly leaked in my luggage (I had thought to put it in a ziploc bag, thankfully), and by the time I used it, the spray had stopped working all together. I tried running it under hot water, but nada. On the first day, I managed to dribble some out and smoosh it on my legs -- not elegant, perhaps, but still effective. The 2nd day, I didn't feel like bothering with it, and my laziness was rewarded with several itchy bites around my ankles. I'm not sure if the can was just too old, or if several trips on a plane somehow mucked up the mechanism. 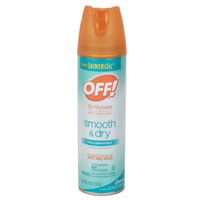 But it did work great on the first round, and I'll be sure to pick up another can before the summer's out -- that is, until they finally figure out how to make a truly scent-and-texture-free bug spray. I hear it will be based on pheremones of people who never get bitten!